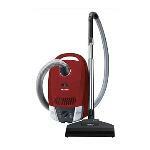 Miele Compact C2 Cat & Dog Expert Reviews - Read Reviews and Buy Smarter Online. Verdict: Models in Miele's Compact C2 range are smaller, lighter siblings of the C3 models. This Cat & Dog version weighs in at under 5kg, includes a Turbobrush head that's ideal for picking up pet hairs and is fitted with an air filter with activated charcoal to keep unpleasant odours at bay. Verdict: Fantastic product. I don't have to use too much strength to pull it around, it just follows me so easily. Great suction. Can't ask for a better vacuum. Verdict: Having previously owned 2 Miele cat and dog cleaners before I thought I would just replace with same. Big mistake. Sadly this model is nothing like as powerful as the old ones. It takes twice as long to do the job as the suction is so weak! Verdict: We bought this to replace the previous Miele Cat & Dog vacuum cleaner that we had for over 12 years, and which I continue to use when cleaning up after doing DIY jobs. Like the old one, our new vacuum cleaner is very robust and does an excellent cleaning job. Verdict: This vacuum came quickly, set up quickly and runs so quietly. It has lots of power and well worth the money.